This page contains the same mod as the Atari 2600 Faq. With the exception of the CD4050 buffer. As you can see at this mod comparison site, the mod actually looks a bit better without the chip. The TIA chip outputs the Luma signal in digital form and you have to perform a simple digital to analog conversion with the circuit below. As the sync appears on the luma line in s-video, the synch signal is mixed in here as well. A common-collector amplifier is used to drop the output to the correct 75 ohm impedance. 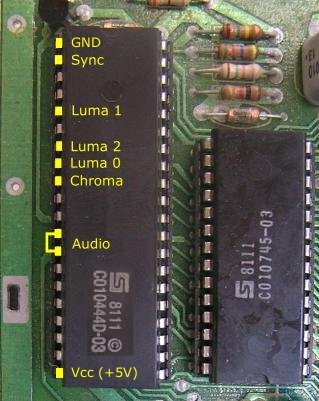 The 2600 FAQ specifies the Chroma and Audio sources differently. You can find the audio at the junction of R206/C208, but this point is wired directly to pins 12 and 13 on the TIA chip. The Chroma is a bit more complicated. The FAQ says to pull the Chroma signal at the junction of C210 and R210. In this case there is some circuitry between pin 9 (TIA Chroma) and C210/R210. So you can get chroma at C210/R210 or connect directly to TIA pin 9 and add a capacitor and pullup resistor to the Chroma circuit above.